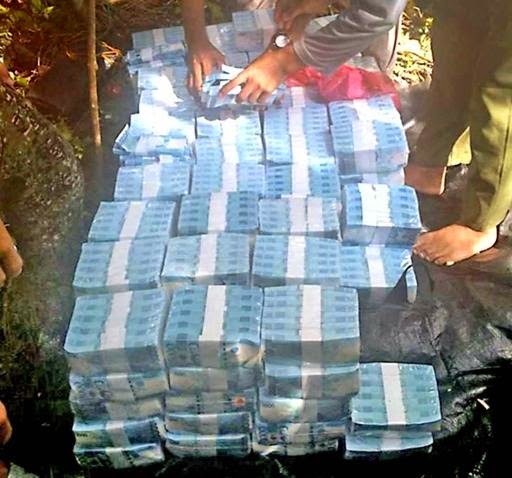 Abu Sayyaf bandits displays a pile of money worth 250 Million Pesos which was allegedly the ransom of German hostages last month. The photo of money of Abu Sayyaf surfaces in social media and garnered criticism. Critics said "If this is true that ransom was given to free hostages of Abu Sayyaf then they will take another to get another ransom". "The government must give official statement on what had happened during German hostages were freed by terrorists. They said that they did not gave any ransom but what about this money they showed." ZAMBOANGA CITY – Abu Sayyaf spokesman Muamar Askali has released a video clip showing what the bandits claim to be the P250-million ransom paid to them in exchange for the freedom of two German captives. Askali, alias Abu Rami, posted on Facebook last week a video clip of the stacks of cash in an effort to dispute reports that no ransom was paid when they freed German couple Stefan Viktor Okonek and Henrike Dielen last Oct. 17. The video showed the Abu Sayyaf piling bundles of P1,000 bills in five stacks, neatly wrapped in transparent plastic, with each stack estimated to be P1 million. The money was placed on top of a large black plastic bag. The video clip that ran for two minutes and 57 seconds also showed the militants standing around the money bag with a black flag of the Islamic State in the background. Some of the militants were overheard counting in the Tausug dialect. “Al-hamdu-lillah (all praise and thanks to God), we counter the Philippine government that they said that no ransom policy. And now for the sake of the Shariyah Islamiyah, the no ramsom policy will be lost at this moment,” Askali said in the video clip. Askali also showed a picture of one of the blue traveling bags used in concealing the ransom money.